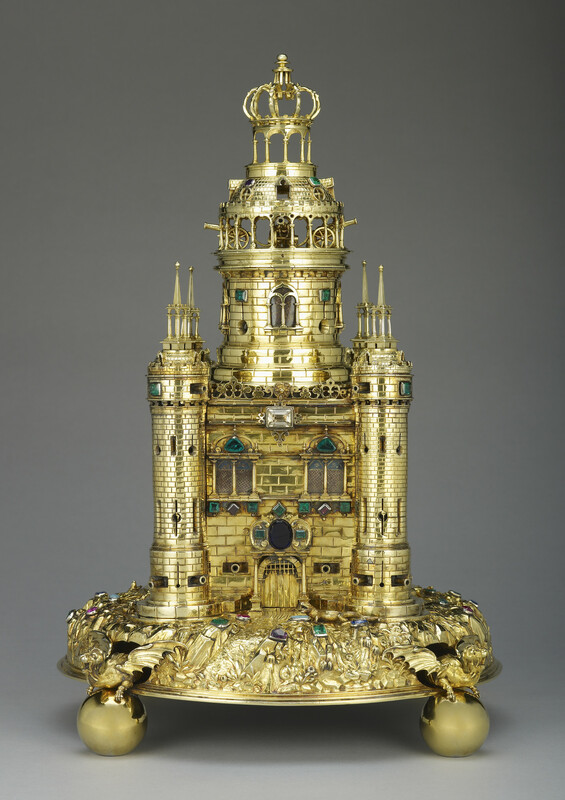 A silver-gilt table salt in the form of a tower with cylindrical corner turrets and a tall central turret with an open gallery and domed roof above, resting on a chased mound supported by dragons on ball feet, the salt is encrusted with jewels. The body of the salt (or spice box) is fitted with small drawers. This extraordinarily lavish object was a gift of propitiation to the newly restored Charles II from the formerly Parliamentarian stronghold of Exeter. As early as 25 June 1660 the city chamber voted to offer the king a faire piece of plate of the value of 500li or 600li, not under 500, [to] be in all humble manner presented unto His Ma'tie from the Chamber of this Cittie, togeather alsoe with the tender of their loyaltie'. By August of that year a gift had been selected at the cost of £700. The resulting offering was this work, the so-called Exeter Salt or Salt of State. It is in fact fitted with small drawers in the lower section of the castle, and therefore might more properly be termed a spice box. The elaborate work is the only known surviving piece by a Hamburg goldsmith, Johann Hass, and was supplied through the royal goldsmith, Sir Robert Vyner, on behalf of the city of Exeter. The history of the work, however, weaves a certain ironic strand into the provenance of the piece. It appears that the Salt formed one of a group of gifts purchased in Hamburg in 1657, on behalf of the Cromwellian government, as part of an embassy to Russia. The Tsar, Alexei Mikhailovich, had ejected the British from St Petersburg following the regicide in England, and later went on to offer support to Henrietta Maria. In an attempt to mollify him and re-open the important trade routes with Russia, Secretary Thurloe despatched the British Resident (Ambassador), Richard Bradshaw, from Hamburg to Russia to treat with the Tsar. Bradshaw, a fervent Parliamentarian, was reluctant to undertake the journey, but did so in 1657–8, purchasing gifts for the Tsar in advance and proceeding as far as Riga. His mission, however, was a dismal failure, many of his party dying of the plague as they travelled, while the Northern Wars raged around them; moreover the Russians refused to accept any treaty from the English at this date. Bradshaw, disheartened after eight months of waiting to cross the border onto Russian soil, eventually returned to Hamburg and then to London, apparently still carrying the gifts of plate he had purchased before his journey. These he appears to have sold in order to recoup some of the losses he made on his abortive mission. It is not known whether he sold the works directly to Vyner or to some other dealer, but they were eventually acquired on behalf of Exeter for presentation to the king. Much silver that appeared on the market in Russia and Scandinavia in the seventeenth century originated in Hamburg, which acted as a hub for the export of elaborate buffet plate. In this case the form of the Salt is drawn from German incense burners that were occasionally created in the form of castles on rocky bases. The form was unusual in England and the Salt was mistakenly thought, for many years, to be a model of the central keep of the Tower of London, the White Tower. In fact, the piece is a fantasy, complete with miniature cannons and roaring dragons. A similar piece in the form of a castle, which acts as a perfume burner, may be found in the Armoury collection of the Kremlin, in Moscow. The gemstones are unlikely to have been original to the piece and may have been added at the time of Charles II's coronation. The early broadsheet guides to the items in the Jewel House of the Tower of London make clear that the Salt was kept purely for use at coronation banquets, appearing on the buffet as an impressive work of wrought silver, and that it did not otherwise feature on the royal table. Struck with maker's mark of Johann Hass. Johann Hass is recorded as a member of the Hamburg Goldsmiths' Guild from 1621, when he was granted citizenship. He took three sons and six others as apprentices and died in 1650. Text adapted from Charles II: Art and Power (2017). Presented to Charles II by the City of Exeter, 1660.The windows of the castle were enamelled for the Coronation banquet of George IV in 1821.